This mantra – making complex biology meaningful and interpretable – has driven the last decade of Cofactor’s work in RNA. 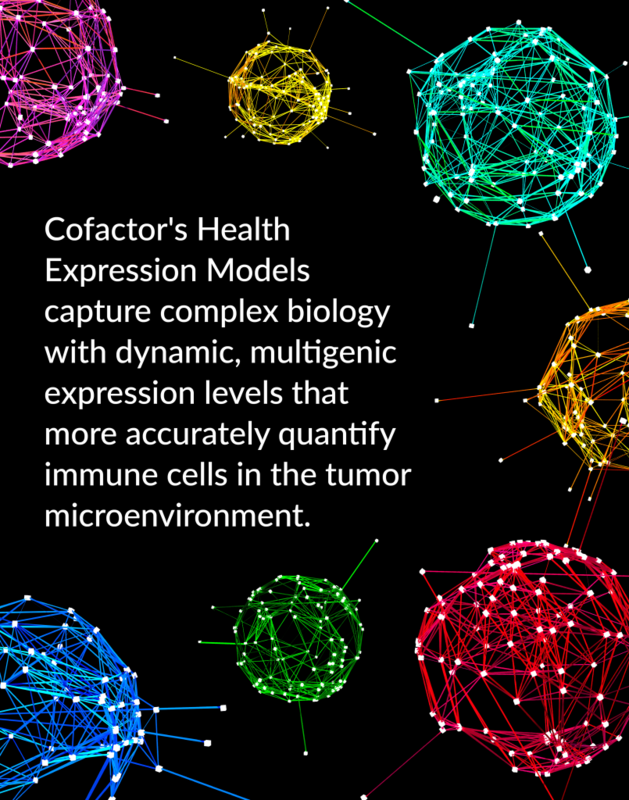 Our advancements have enabled us to build a database of Health Expression Models, which provide unprecedented accuracy for immune profiling (hear more about this in our recent webinar highlighting results from our CAP validation study). Today, we pair these Health Expression Models with other RNA data (escape gene expression) using Predictive Immune Modeling to generate some of the most powerful multidimensional biomarkers that the industry has seen. But we’re not done yet. We know there’s more information that can be extracted from this approach, and we’re continually working to push this discipline forward. In an era of big data, why we’re taking this approach may not be clear. So, I thought I’d take a moment to dive into Predictive Immune Modeling and how it aligns with drug development, patient stratification, and clinical treatment options in a bit more detail. We believe the first step is to better characterize the biology we know to be important. We have accomplished this by using machine learning to define multigenic gene expression models, which we call Health Expression Models. Our database currently includes Health Expression Models for key immune cells, known to be important in understanding immune response to therapies. We built these models by isolating purified immune cell populations (using flow cytometry and canonical cell-surface markers). Then, whole-transcriptome sequencing was performed to evaluate the global transcriptome profile of the immune cell. From there, these gene expression signals were evaluated using machine learning to define a subset (read: hundreds) of genes whose expression levels uniquely define each immune cell. This reduced representation of genes was used to define Cofactor’s specific molecular protocols for ImmunoPrism. Without this focused molecular approach, and these highly-specific gene expression models, we would not achieve the unprecedented signal to noise and immune cell sensitivity, also discussed in our recent webinar. We’re proud of how this investment in Health Expression Models has truly paid off in the immune profiling results we’ve observed, and we’re pleased to offer access to this database through the ImmunoPrism assay. Taking things one step farther, when our goal is to predict response to therapy, or develop predictive biomarkers, we want to capture as much context as possible. This is where Predictive Immune Modeling has additional advantages over single-analyte biomarkers. Predictive Immune Modeling enables us to combine all molecular signals into a multidimensional biomarker, again using machine learning. To generate multidimensional biomarkers with the ImmunoPrism assay, we first stratify the patients based on a clinical outcome metric. This could be any measure of response (PFS, OFS, survival status), disease progression (months to relapse), or observed clinical phenotype. Using these patient groupings, the machine learning algorithm combines the quantitative immune profiling (using immune Health Expression Models) and escape gene quantification results and identifies what combination of analytes most accurately and uniquely defines the two clinical groupings. The statistical power of this approach is reported including p-value, predictive accuracy, PPV and NPV, alongside recommended selection thresholds for using this multidimensional biomarker in future prospective studies. The information delivered by the ImmunoPrism assay aligns with the drug development pipeline, from translational through clinical applications. Quantitative assessment of immune composition is important in understanding mechanism of action, confirming or predicting response, and developing predictive biomarkers to be used in a prognostic setting. ImmunoPrism enables you to leverage our investment in Health Expression Models, machine learning, and a highly-sensitive, validated molecular protocol. ImmunoPrism is a complete solution – beginning with RNA extraction through immune profiling and onto the generation of multidimensional biomarkers. Each stage of the assay delivers an easy-to-interpret report, and our team would be happy to walk you through how you can make the most of the information you’ll receive. Are you a fellow proponent of multidimensional data and biomarkers? We’d love to hear your take on what we can learn from others who are making strides in the field of Predictive Immune Modeling. Note: Cofactor’s ImmunoPrism™ Assay is offered both for Research Use Only (not to be used as a diagnostic assay) and as a CAP-validated assay. Please contact us to discuss which option is right for your application.